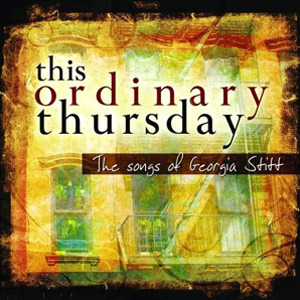 This Ordinary Thursday, the extraordinary debut album of songs by Georgia Stitt, features vocals by some of Broadway’s brightest stars, including Sara Ramirez (Tony Award-winner for Spamalot, currently starring on TV’s “Grey’s Anatomy”), Faith Prince (Tony Award-winner for Guys and Dolls), Susan Egan (Broadway’s original Belle in Beauty and the Beast), Kelli O’Hara (Tony nominee for The Pajama Game, opposite Harry Connick Jr.), and Matthew Morrison (Tony nominee for The Light in the Piazza). Seen by millions each week as the vocal coach on NBC’s primetime series, “Grease: You’re the One That I Want,” Georgia Stitt is known as a composer-lyricist with a style and sensibility all her own. Clever, sophisticated, and memorably melodic, This Ordinary Thursday is one debut album not to be missed.